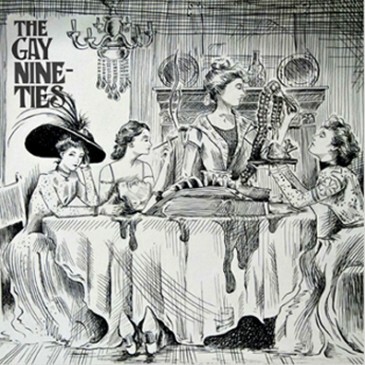 From the opening drum blast and guitar progression on the first (and title) track of their debut EP Coming Together, The Gay Nineties set the tone with a tight sound, catchy hooks and bop-your-head at a steady pace kind of tempo. The well-produced sound is thanks in part to Steve Bays of Hot Hot Heat fame, who brought both his engineering talents and his white-man afro to work with the Gay Nineties – which is not a reference to the decade that produced the likes of Melissa Ethridge and Lance Bass, but in fact a nostalgic term for the scandalous 1890s. The three-piece, consisting of Parker Bossley on guitar, Malcolm Holt on percussion and Daniel “Pants” Knowlton on bass just returned to Vancouver after a successful Canadian tour to promote the EP’s release. Lead vocalist Bossley’s octave range easily leads to comparisons with Raine Maida (Our Lady Peace) or Ben Kowalewicz (Billy Talent). Throw in Bays’ production talents and that’s not a bad company of Canadian rock to be keeping, eh! The best track is probably “Favorite Game,” where the band gives us their best English indie rock-inspired effort, complete with soothing harmonies provided by Knowlton. It’s the kind of song that would impress even the Kooks or the Arctic Monkeys. And “Nothing’s Wrong,” the closing track, will have you singing along with its catchy chorus by the end of your first listening. The EP is good, but The Gay Nineties’ stage presence is larger than life, as witnessed last fall at the Anza club. Your best bet is to download the album, listen to the tracks, then check out one of their live shows and join me as we all sing “Nothing’s Wrong, Nothing’s Wrong” in unison at their next gig.